Delicious chicken Teriyaki flavor with hint of ginger and the bitterness of Goya. Goes great with white rice!!! 1. Cut both ends of Goya, then cut into 2/3-inch pieces. Scrape off the seeds with a spoon and dust with flour (inside as well). 2. Put A in a bowl and knead well by hand until smooth. Stuff each with the mixture. 3. 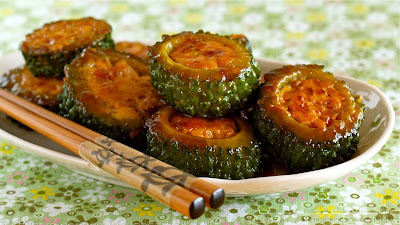 Heat sesame oil in a frying pan, place the stuffed Goya, then cook on high until golden brown on both sides. Then cover and cook on medium for about 3 minutes. Drizzle with B (Teriyaki sauce) and cook until the sauce thickens.